Introducing the Zebra 3600 Ultra-Rugged Series, a new class of scanner designed to work in the toughest conditions. In manufacturing plants, warehouse aisles, outdoor yards and seaports, the success of your business rests heavily on the scanners in the hands of your workers. The quality of your products and your ability to deliver the right products to the right customer on time is heavily dependent upon the fast and accurate capture of many barcodes throughout the day. Wait times between scans, barcodes that can’t be read and downtime when a scanner fails create unacceptable delays. Every minute lost reduces productivity, potentially impacting labor costs, order delivery times, profitability, customer satisfaction — and customer retention. You need technology that you can count on, every minute of the day. Superior scanning performance on virtually any barcode in practically any condition — period. An ultra-rugged design for unprecedented durability in ultra-challenging environments. Unrivaled management tools that reduce management time and costs to a new low. 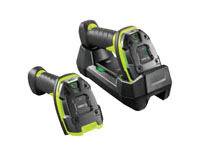 Twelve corded or cordless models that can scan nearer and farther than their competition. Designed for near-range capture of 1D/2D barcodes, from near contact to nearly 5 ft./1.5 m.
Ideal for shipping and receiving on the loading docks, small item pick and pack, plus manufacturing work-in-process. Ideal for protecting product quality on the electronics and medical equipment production line — ensures workers use the right product components at the right time, every time. Designed for mid-range reading of 1D/2D barcodes 40 percent farther than the DS3608-SR/DS3678-SR — up to 7 ft./2.1 m away — with the flexibility to capture photos, documents, signatures and OCR. Ideal on the loading docks for fast processing of incoming and outgoing shipments — from reading shipment labels for instant reconciliation to capturing signatures for proof of delivery and photos for proof of condition. Designed for near-range reading of 1D barcodes. Ideal for shipping and receiving on the loading docks, small item pick and pack and manufacturing work-in-process. 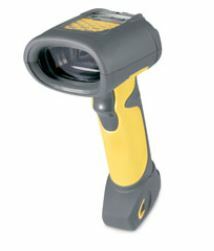 Designed to capture virtually every type of direct part mark (DPM) and 1D/2D barcode. Designed to capture standard and extra-wide 1D/2D barcodes over an industry-leading extraordinary range — from 3 in. to 70 ft. — 35 percent farther and 60 percent closer than competitive models. Ideal in warehouses and ports, where workers need to capture small to very wide barcodes on items at close range as well as items on upper warehouse shelves or stacked containers in a rail yard or port.